The schema at right presents the heart of the Society of St. Pius X’s new book on Pope Paul’s “Novus Ordo” Mass. At the heart of the schema is the box framed, which presents the “New Theology” version of the Redemption. 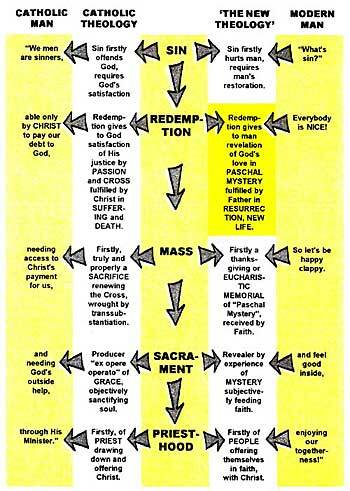 As the schema’s arrows indicate, while the Catholic Mass creates Catholic Man, it is modern man who has created the Novus Ordo Mass. Modern man believes neither in original sin nor in the gravity of personal sin. Hence around the Second World War there arose what was called a “new theology”, or a new way of thinking about God, man, sin and Redemption, all of which naturally led to a new concept of the Mass. In particular the Redemption was re-thought and re-named as “the Paschal Mystery”. The old “negative” way of thinking is that men’s sins so gravely offend God that only Christ could pay our debt, which he chose to do principally by his death on the Cross. The “nice” new “positive” way of thinking is that no human sins can break God’s luv (mis-spelt because mis-conceived) for men, as Christ came merely to show, especially-naturally-by his Resurrection, manifestation of joy and new life. Christ is the “Mystery”, “Paschal Mystery” expresses all he did in Holy Week, but culminating in the Resurrection. “The Problem of the Liturgical Reform”* shows how Mass, Sacrament and Priesthood also are correspondingly re-modelled by the Novus Ordo liturgy to fit modern man. In the war of religions presently raging between Catholicism and Conciliarism, the new pseudo-Catholicism let loose by the Second Vatican Council (1962-1965), the book recently published by the Society of St. Pius X, “The Problem of the Liturgical Reform, the Mass of Vatican II and Paul VI”, is a powerful cannon-ball. By imposing his Novus Ordo Mass on the universal Church in 1969, Paul VI took the major step, at least as far as the mass of ordinary Catholics are concerned, in switching Rome from Catholicism to Conciliarism. By modernizing the Mass he hoped to save the Church. However, the fruits of its now 30 years of use have shown that it works instead as the major engine of destruction of the Catholic Church. How could the highest Church authorities have been so mistaken in putting together the New Mass, and how can they still today be insisting on keeping it in place? By collecting and putting in order a series of quotations from the so-called “new theologians” before and after the Second World War, “The Problem of the Liturgical Reform,” answers this question. The Conciliar Church authorities behind the New Mass were and still are in the grip of a whole false but coherent way of thinking about God, man, life and religion. Their minds are possessed by a diabolically brilliant substitute for Catholicism, which hangs together in all its parts and which looks much better calculated to get through to modern man. Here is why these authorities cannot understand Catholic Tradition. Here is why they can seem to have subjectively the best intentions in the world while objectively they make unrelenting war on Catholic Tradition. Here is why the Vatican II Rome cannot invite the SSPX (for instance) to sit down for talks without so negotiating as to destroy it. It is no use being under illusions about how soon or how easily the war between Conciliarism and Catholicism will come to an end.